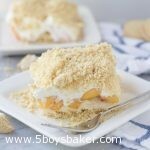 This Golden Oreo Peach Dessert is completely fabulous! It’s light, refreshing and so simple to make. 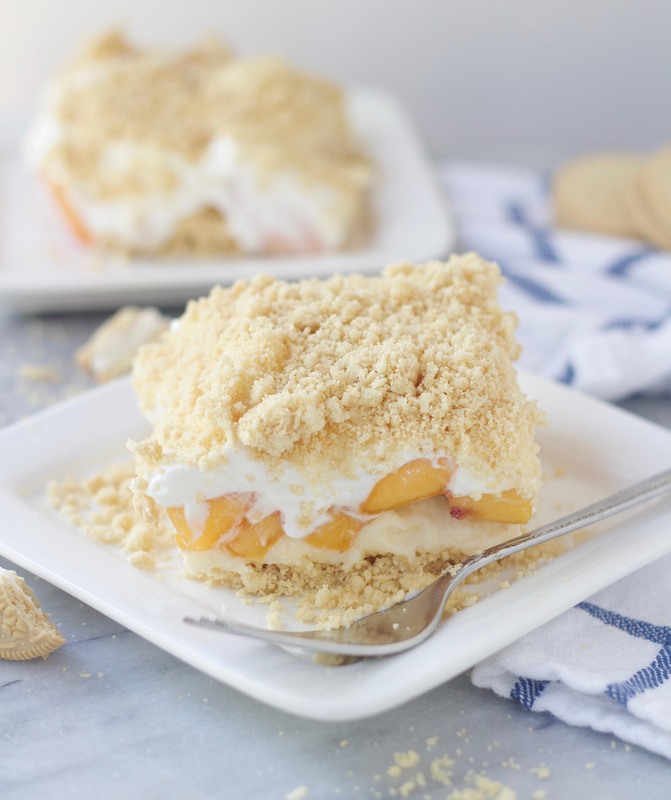 The perfect dessert to make with delicious, fresh peaches! Peaches are truly one of the things I look forward to all year long. There is nothing like a fresh, sweet, juicy peach. I devour them any chance I get. We had three peach trees at my old house and I miss them every summer. We really need to plant one or two. Thankfully the peaches lately from Costco have been spot on delicious. 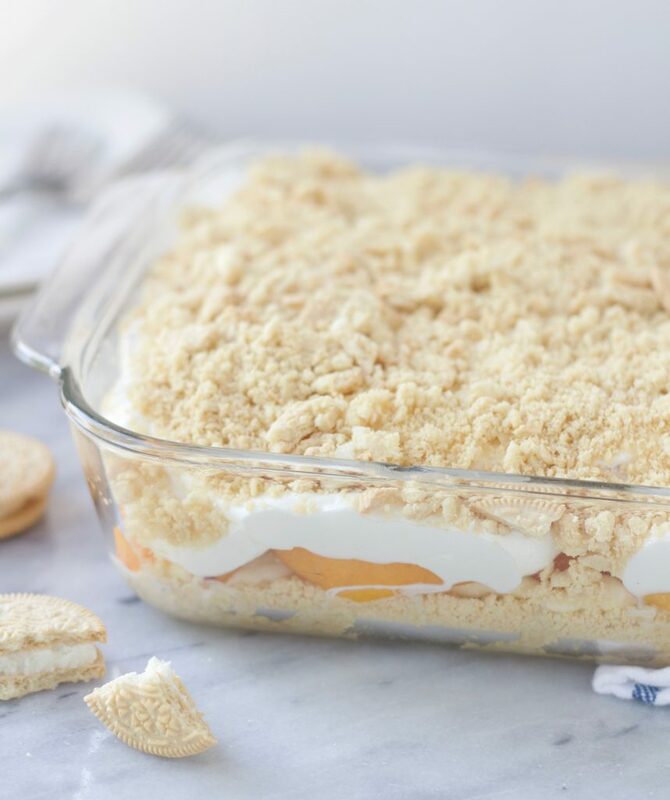 Since I’ve already made my fresh peach dessert about four times in the last month, I decided to branch out and make this Golden Oreo Peach Dessert. It’s pretty fabulous too and super simple to make. I actually can’t believe I haven’t shared this one yet. I had this years ago at an open house and fell in love with it immediately. I asked my friend for the recipe and she told me she’d put it in our ward cookbook. Um, how in the world did I miss that recipe? I went through that cookbook cover to cover when I got it. This is simple, delicious and easy to make. You can also use strawberries instead of peaches, but why would you? Nothing against strawberries, I happen to love them, but on most days, I’d take a fresh peach over strawberries. Hopefully you can get your hands on some sweet, juicy peaches and make this fabulous dessert. This can easily be halved and made in an 8x8 pan. My friend's recipe calls for Cool Whip, but I made it with real whipping cream one time and loved it. It's delicious with both, but if I had to choose, I'd pick the whipping cream. I usually use the double stuff Golden Oreos, but regular are fine too. I like to leave a few small chunks in my Oreos, so I don't crush them super fine. You DO NOT add any melted butter or anything to the crushed Oreos, you just spread and press them in the pan as is. Crush cookies using a food processor or place them in a Ziploc bag and use a rolling pin. Spread half of the cookies into a 9x13 pan and press evenly. Cream the butter, eggs and sugar together using an electric mixer, until well combined. Evenly place sliced peaches over creamed mixture. Spread Cool Whip (or whipped cream) over fruit. Sprinkle with remaining crushed cookies and refrigerate at least 4 hours. I have some Girl Scout shortbread cookies I need to use up. Wonder if they would work as a replacement for the golden oreos. Looks good!! I think the shortbread cookies would work just fine. The frosting in the Oreos does act a little as an “adhesive”, so they aren’t as dry and crumbly, so you actually might want to add just a little bit of softened butter to the cookie crumbs. 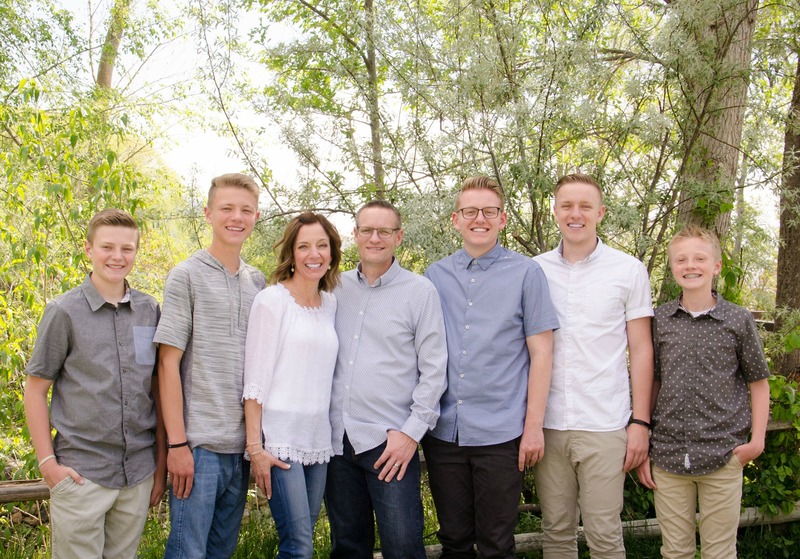 Hey Jodi, am I missing something? Are you supposed to cook it with the raw eggs in the recipe? No you don’t cook this Kelly, so if the raw egg thing worries you, then you could leave them out but you will probably want to add a little bit of liquid (milk or cream) so that the butter/powdered sugar mixture spreads over the cookie crumbs a little easier. I don’t have an issue with raw eggs, I’ve been eating cookie dough my entire life and have been just fine (lol! ), but I know some people do. I’m so glad you shared this with everyone!! I’m making it again this weekend. Thanks for the yummy recipe Kristy!